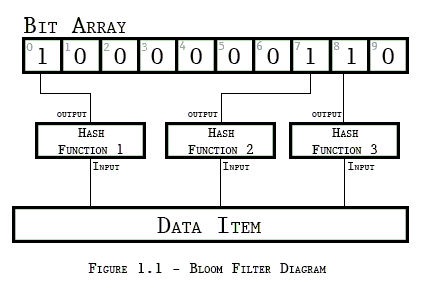 The Bloom filter is a space efficient, probabilistic data structure, designed to test the membership of elements to a set. The trade-off for being a space efficient data structure is it may return false positives, but always returns definite negatives: Meaning Bloom filters can accurately test an element for non-membership to a set, but can only with probability test an element for membership. Bloom filters find application in circumstances where testing for non-membership saves resources such as calls to a web server, checking a proxy cache. Google uses Bloom filters in the Chrome browser as a preliminary check for malicious URL's. Thank you for reading - I'll keep on editing this tutorial in the future. Thank you for this. What a simple and profound idea! My gratitude as well, I just learnt something.